Fly Away Peter . . .
‘Yes, yes, what I really mean is glorious silence. Isn’t it beautiful! ‘I wonder what they did with the TV remote before they left? Hold on. let me lift the sofa cushions up, we may as well know what we’re up against. I thought they promised to run round with the Hoover before they went? ‘Something on the floor, I felt it crunch when I stood on it. Today’s picture is quite an interesting one. Although we know what it is, we actually don’t know what it is. Even poor old Google became so confused he threw up his hands, and threw in the towel. It’s either a Common Knapweed or a Lesser Knapweed. 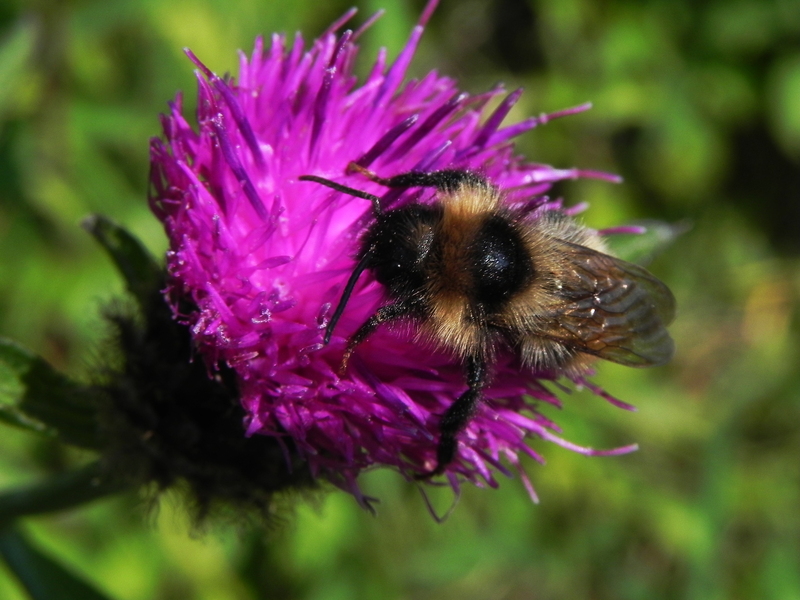 The problem is that the Common Knapweed has been seen dallying with the Lesser Knapweed. Now, you might think that the Lesser Knapweed was getting a bit above itself and should, no doubt, be put in its place. Except, of course, there is the fact that the Common Knapweed is, well, you know, erm, common, so in fact, the Lesser Knapweed may just be the best it can do to better itself. Never the less, for the sake of decency, they should be encouraged to stay with their own kind. I’m sure there are enough nice Common Knapweeds around. There really is no need, at all, for them to venture over on the wrong side of the track and fraternise with those ‘Lesser’ plebs. But then, there are those who say – “It’s too late!” The differences between Lesser and Common cover the entire spectrum. There is nowhere to draw the line. Only a large, fuzzy area somewhere in the middle. Surely, Linnaeus could have said something. I blame that bee myself. 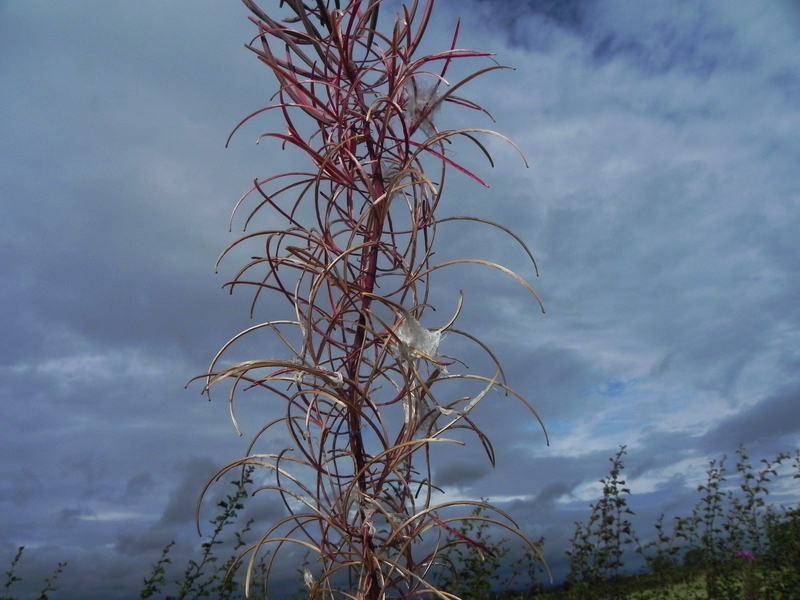 I know that thistledown has a reputation to live up to, but all it does really, is take its payload and dump it somewhere downwind. It takes a decent bit of wind, too, to shake the seeds lose. Our thistle seeds have become quite used to having full access to all the modern conveniences of life – otherwise known as parents. They are happy to join their peer group, busy building the hype surrounding life at a university at the other end of the country. But still, when it comes to the time to actually leave home, that place that they couldn’t wait to get out of, it suddenly seems safe and familiar,and childhood so much more preferable to adulthood. 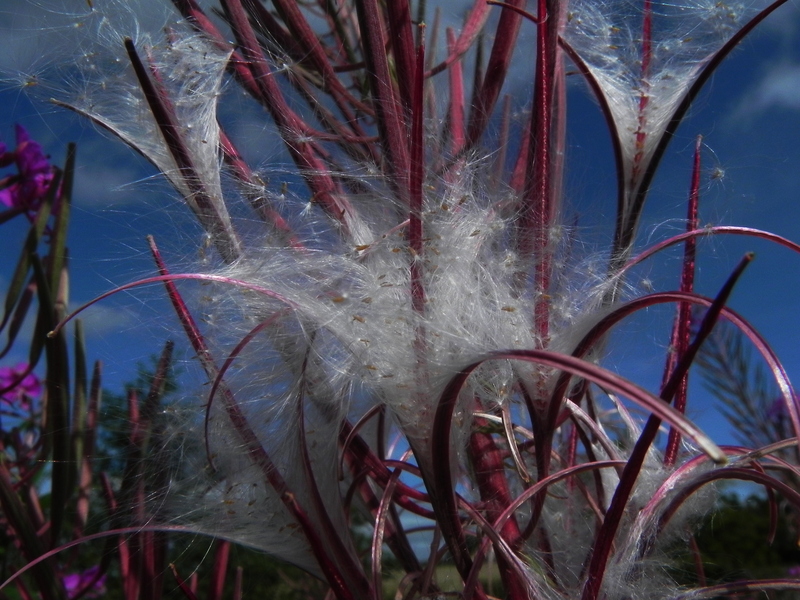 The Rosebay Willowherb uses much the same distribution network – a fluffy, almost-lighter-than-air contrivance surrounding each seed. No hanging on to childhood for Rosebay teenagers. All it takes is a nice sunny day, and the seed cases, looking like miniature runner beans, split sharply open and the scions of the house are ejected, unceremoniously, out into the cruel world. On our way down to the beck the other (nice sunny) day, we looked ahead to where the banks of Rosebay Willowherb line the road. Oh! The angst! The trauma! It seemed as if we were walking into a snow storm, a perfect blizzard of airborne histamine. And that gets right up my nose. Today we have Hawkweed, or perhaps, I ought to say one of the Hawkweeds. When we have nothing to complain about – which isn’t often, I must admit – we can usually find cause for concern amongst the nomenclature of plants. This is usually sufficient to keep us occupied until an issue of more immediate concern arises. You see, the Hawkweeds have a disconcerting habit of setting their seed, whether they have been decently fertilised or not. This covert cloning means that local variations abound, and are replicated with a complete lack of discretion. There are around three hundred different Hawkweeds – most of which you have to dismember down to their chromosomes in order to tell them apart. As a herb, we humans use them in much the same way we use the Dandelion, and I’m guessing that most of us would be happy to just call them Dandelions, and let it go at that. 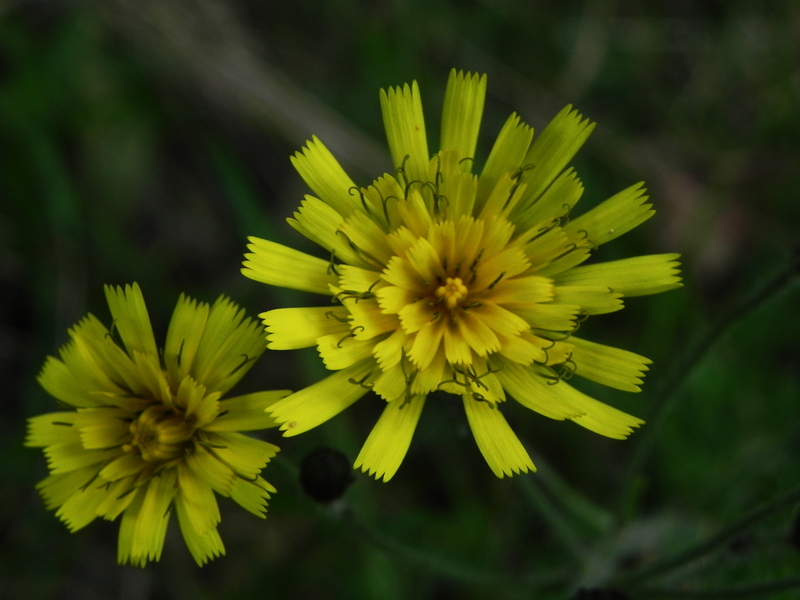 However, hawks, down through the ages, have believed that the Hawkweed flower is good for their eyesight. This is obviously an old wives’ tale. Did a little bird tell them, I wonder? As can be seen from the state of the petals in our picture. The raptor community is obviously conservative, it’s not likely to move with the times and start wearing spectacles any time soon.